MemTech M1 is a flexible, loose laid ground Gas Barrier Membrane made from low-density polythene with a foil core layer. MemTech M1 can be used as a gas barrier and damp proof membrane for application on concrete ground floors, above and below the slab (not subject to hydrostatic pressure), to protect a structure against moisture, radon, methane and carbon dioxide contaminates from the ground. MemTech M1 will protect against the ingress of hydrocarbon Vapours where is it separated from the ground (e.g. above a block and bean floor). A flexible, loose laid proprietary gas barrier for use on sites with Radon (RN), Carbon Dioxide (Co2), Methane (CH4) ground gas. MEMTECH PRO M1 will also protect against the ingress of Hydrocarbon Vapours where it is separated from the ground e.g. above a block and beam floor. MEMTECH PRO M1 is printed on the top side with the M1 logo. The barrier is manufactured by an extrusion/coating process which incorporates a two layer low density polyethylene membrane with a polypropylene reinforcement grid and an aluminium foil core. 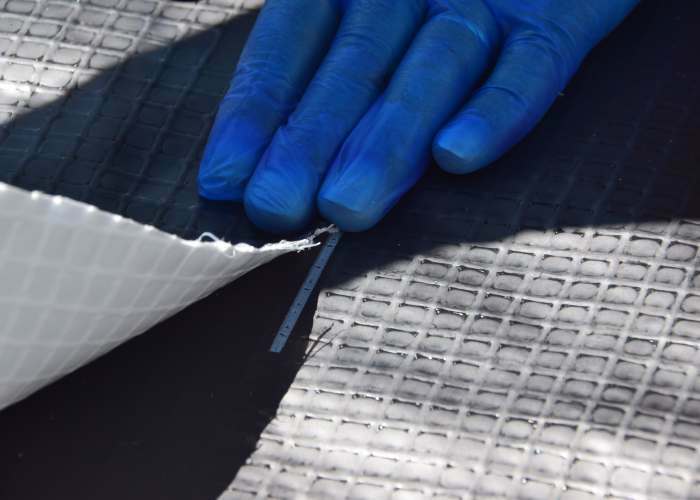 The membrane is extremely flexible for ease of installation and is robust enough to cope with site conditions. M1 is manufactured to meet the requirements of BRE 211: 2015, Radon: Guidance on protective measures for new buildings and BS8485:2015, Code of practice for the design of protective measures for methane and carbon dioxide ground gases for new buildings. M1 Gas Barrier will also protect against damp and therefore will act as a DPM in accordance with CP: 102:1973, section 2 and BS: 8000-4:1989, and National Building Regulation Approved document C.
The Gas Barrier should be designed and specified in accordance with the most up to date guidance and most recent regulations. Attention is drawn to CIRIA C665, C716, C735, C748, and BS8485:2015 and CIEH guide to Ground Gas. M1 can be tape jointed or heat welded. In either case adequate care should be taken to ensure a seal between the joint. If taping joints a 40mm silicone roller should be used to remove any trapped air.